One of the largest manufacturers and providers of active pharmaceutical ingredients, Teva Pharmaceutical Industries Ltd. was founded in Israel. Today this company is a global company specializing in pharmaceuticals with major manufacturing and marketing facilities in Israel, North America and Europe. 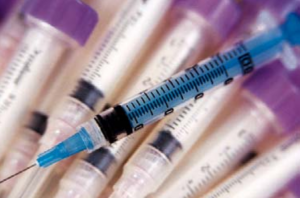 As one of the largest generic pharmaceutical companies in the world, Logistics and Material Handling must be executed with the highest priority for efficiency and cost. area while still being ergonomically suited for the individual employee who is conveying the drugs. DOLAV Plastic Products presented a working solution – both ergonomically correct and cost efficient. 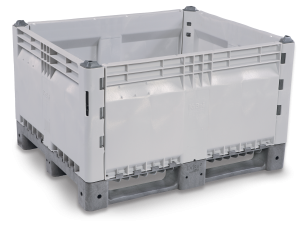 The KitBin® is, to all intents and purposes, a multi-purpose system that encompassesall stages of material handling. by leaving one wall detached. For this specialized factory, a special solution was necessary. The KitBin® was used in a most strategic manner – three high with the walls of three KitBins connected by small yellow clasps and only one pallet as the base of all three. 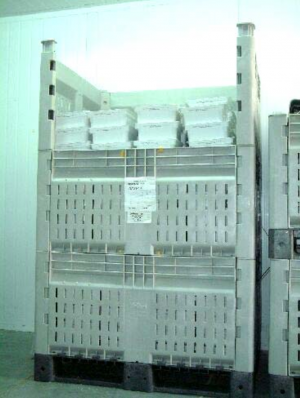 At the pharmaceutical production line – the KitBin® was placed with one wall open. and a lid and pallet can be easily added. box pallets for almost thirty years.